In 1950, the mathematician, Claude Shannon, published a groundbreaking paper titled Programming a Computer for Playing Chess. In it, he described how a machine or a computer could be made to play a “reasonable” game of chess. Around that same time, Alan Turing, an English logician and cryptanalyst, was developing his own related ideas about creating a chess-playing algorithm. While working independently of each other on classified programs for their respective countries, computer chess turned out to be one of the few shared intellectual curiosities that the two had the liberty to discuss during Turing’s visit to Bell Labs in 1943 where Shannon was working at the time. It was in those casual conversations, some say, that the history of computer chess began. Although initial attempts to pit human players against a computer proved disastrous for the latter, the closed, systematic nature of the game and the ongoing advances in computing power since then have flipped the advantage in the computer's favor. In May 1997, 49 years after Shannon’s paper was published, IBM’s chess playing computer, Deep Blue, defeated Gary Kasparov, the world chess champion at the time, in a highly controversial six-game match. It was a momentous event that put the intellectual superiority of humans over machines in question. Long considered a game of intelligence, chess has become a test bed for artificial intelligence due to the well-defined structure of this game and the ability to monitor and record its play precisely. Since their rather slow start in the 1950s, 1960s, and early 1970s, computers have become exponentially better at playing chess with current chess engines easily able to defeat even the greatest grandmasters under normal conditions. However, whether computation will ever “solve" chess is still an open question. In other words, can a computer ever be programmed to play flawlessly perfect chess? In his paper, Shannon offered a conservative estimate, now known as Shannon's number, of the number of possible playable chess games. The actual number in fact is significantly higher than Shannon estimated and is often illustrated by the popular assertion that there are more potential chess games than atoms in the observable universe. Without a doubt, it is this attribute of inexhaustible possibilities offered by chess that has delighted and confounded players for more than 1,400 years, despite the restrictive rules of the game. Still, beyond the intellectual attraction and pure enjoyment the game provides, can one continue to justify a professional dedication to a game at which a computer will always perform better? Untitled (Zugzwang) presents an ongoing series of chess player portraits within the 64-square grid that is a chessboard. Oscillating between representation and abstraction, these portraits deal in fractured configurations with the abstract. They seem to infer psychological studies that reflect tactical and analytical thinking, thereby offering a glimpse of the appeal, as well as the overwhelming complexity and even the potential trappings, of the deceptively simple, yet unsolvable, puzzle that is chess. On the other hand, thinking about the poster that was used to promote that fateful 1997 game, it might also be appropriate to consider these portraits in terms of how they relate to the complex and never frictionless interaction between humans and technology. The poster showed Garry Kasparov leaning over a chessboard with an intense and menacing look. 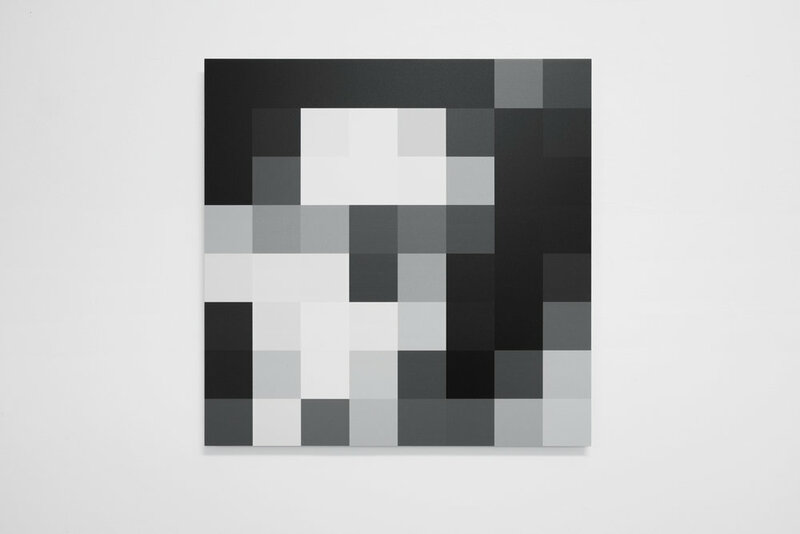 It was captioned “How do you make a computer blink?” Untitled (Zugzwang) can thus also be considered as a counter-response to that poster’s provocative question, which is coldly interpreted in this artwork as the pixilated digital gaze of a machine examining its human subjects.